Even the best scouted spots can turn cold. When that happens, waterfowlers need to strike out into the unknown to find some fresh wildfowl real estate. In the best duck hunting blinds, successful hunters often tell weekend warriors like myself to find the "X." And once you find that magical spot, throw the decoys out, get the cocobolo call ready, and think of your favorite duck recipes. But sometimes, the X isn't so magical. Be it stale ducks, the migration of local birds, a change in the weather, or nearby hunting pressure, skies that were full of whispering wings yesterday may suddenly be devoid of chattering mallards today. When you hit this kind of dry spell, a fresh start may be needed, sometimes even in the middle of a hunt. That is something that I learned a number of years ago from one of my hunting mentors, Jim Lillis, a longtime waterfowling friend and a retired senior regional director for Ducks Unlimited. Having chased mallards and their feathered cousins for slightly more than 40 years, my North Texas pal has repeatedly told me over the years that the No. 1 adage in hunting late-season greenheads is the same one that real estate agents tout — "location, location, location." Over the years, as Lillis has hunted public reservoirs that dot our region, he's never been afraid to strike out with the binoculars, looking for new territory when necessary. 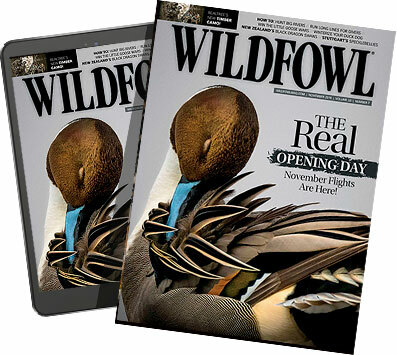 "If they [mallards] are using willow trees or a certain spot in the marsh, you need to set up as close to that spot as you absolutely can the next morning," said Lillis, touting the scout-then-hunt approach that so many of us rely upon. But if that scouted spot of yesterday suddenly grows cold today, Lillis adds that hunters shouldn't wait around too long, hoping that the trend somehow reverses itself. You know, that try, try again thing. If It Isn't Working, Move! A late-season hunt several years ago on a flooded north Texas lake proved that idea to me in spades. Setting up in a good mallard hole before dawn, we thought that we were in the magical spot, the proverbial X as daylight approached. But as the sun rose, flock after flock would circle wide, then quickly disappear overhead, heading for parts unseen. After a steady diet of this, my group of hunters decided to grab a few decoys and wade deep into the newly flooded shoreline woods to see what we could see. Nearly an hour later, we were tired, sweaty, and a little bit on the grumpy side. But we were also full of new hope, set up on a small hole of open water that we had discovered in the woods, chattering out feed calls on our wooden and acrylic duck calls while the morning grew deeper. Well, our post-hunt photos later on that day certainly revealed a group of tired hunters and retrieving canines to be sure. But they also revealed a group of smiling faces posing with limit-filled duck straps of greenheads and even a couple of pintail sprigs. Proving that the idea mentioned at the outset of this story - try, try again - has plenty of merit, even in the duck hunting world. As long as you're willing to strike out into the unknown to find a good piece of new fowl real estate that is. Because sometimes, that's the necessary ingredient in a successful hunt, even after finding the magical X.